Yesterday I wrote a list of words (dog, cat, house, mouse) and asked Sarah to incorporate them into a picture. She balked at the idea, and rather unwillinglyÂ proceeded to draw a dog, a cat, a house and a mouse. But it was practically an illustrated list as there were no other details. I asked her what she wanted to draw instead. 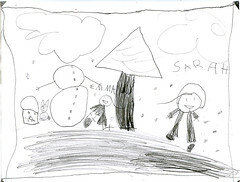 Share the post "Winter art"
1 Response to "Winter art"
I want to move to your house so that I can do art. That is all.